Home / Happy 4th of July from the Three Stwooges! I know, the Three Stwooges has nothing to do with the 4th of July but a girl can pretend. Yes! 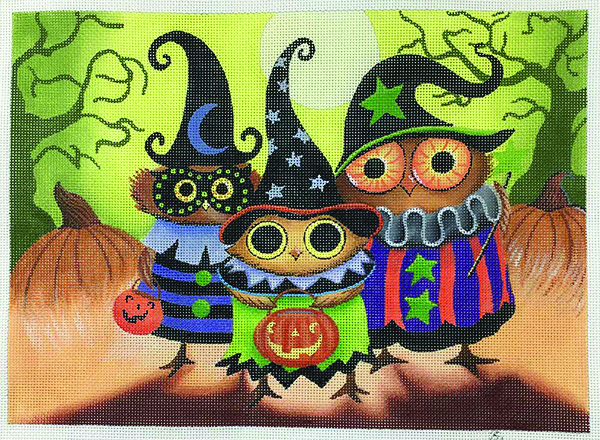 The Three Stwooges are here and they are slated to be our next Mystery Class. The moment I saw this canvas I knew it had to be a mystery class. It’s not too big and its just too cute. How can you resist owls in costume? Imagine the fun we will have stitching this canvas. I’m seeing open stitches and of course some bling. Classes will be August 21, September 25 and October 23; Sunday afternoons from 1-3pm. Canvas design area is 11 x 8 handpainted on 18ct canvas. Class cost is the price of the canvas plus $20 per lesson and the threads, beads etc. necessary for that lesson. The canvas cost for this design is $120.00. You will need 15 x 12 stretcher bars. *Class size is limited. Please sign up early to reserve your space and ensure you receive your canvas in time to start with the rest of the class. A $50 non refundable deposit will be required. Balance due at the first class. If you would like to join the fun you can sign up here or give us a call at 410.296.0405. I hope you are enjoying a happy weekend. « Previous: New in the land of lime green walls….